My First Pet - Visit us at Petland Lancaster, Ohio Today! My First Pet - Visit us at Petland Lancaster, Ohio Today! Male rabbits are called bucks; females are called does. Another term for a young rabbit is bunny, though this term is often applied informally to rabbits generally. Rabbits are herbivores that feed by grazing on grass, forbs, and leafy weeds. Rabbits often sleep with their eyes open, so that sudden movements will awaken the rabbit to respond to potential threats. Rabbits have a remarkably wide field of vision, and a good deal of it is devoted to overhead scanning. Visit Petland and see if a rabbit is a match for your family. In Western culture, the domestic guinea pig has enjoyed widespread popularity as a household pet, a type of pocket pet. The guinea pig’s natural diet is grass; their molars are particularly suited for grinding plant matter and grow continuously throughout their life. 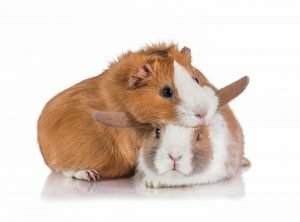 Their docile nature; friendly, even affectionate, responsiveness to handling and feeding; and the relative ease of caring for them have made and continue to make guinea pigs a popular choice of pet. Visit Petland and see if a Guinea Pig is a match for your family. View our other Small Animals Here.